On 9 May, 1913, the most popular pulp fiction character in France made the jump from page to screen, in Louis Feuillade's Fantômas - In the Shadow of the Guillotine. So the first thing we should stop to observe is that this film was basically the equivalent of Iron Man 3 a century later: a critic-proof, and essentially quality-proof opportunity for filmgoers to spend time with a character they already knew they loved. Not bad, considering that it's usually regarded nowadays as a fascinating time capsule made in an era when the basic grammar of cinema was so fundamentally different that only historians and specialists could possibly care about it; best enjoyed, that is to say, by exactly the kind of people least inclined to enjoy, or even think about watching, Iron Man 3. Pop culture is a funny thing like that. Actually, the first thing we should have stopped to observe, perhaps, is that In the Shadow of the Guillotine is the opening film in a five-part serial that Feuillade released over the course of 1913. Because they are all feature-length (this first episode, the shortest, is 54 minutes long) it is customary to regard the complete Fantômas as a five-movie series, rather than a single movie divided into segments, as is typically done with the director's later serials, Les Vampires, Judex, and Tih Minh. Far be it from me to flaunt convention, even if this one doesn't make all that much sense to me; for this reason, my centennial celebration of the movie that invented the cinematic super-criminal will be a review in five parts, considering each individual feature in turn. I'll beg you not to mention when I lapse into desperate repetition sometime in episode three. In the meantime, let us content ourselves with the first story in what would ultimately prove to be over five and half hours spent in the company of the most dangerous man in pre-WWI France, a thief and assassin named Fantômas, created by authors Marcel Allain and Pierre Souvestre, played in this iteration by René Navarre, leading man at the Gaumont film company. As far as raw narrative goes, In the Shadow of the Guillotine is a shameless potboiler and predicated on a fabulous series of contrivances, and it's all too deliciously giddy for words if you're able to find a way onto the film's wavelength. Divided into three parts, the story opens with a simple introduction, not that the audience of the day needed it: Navarre, in close-up, transformed into three disguises through the power of the dissolve. It would be a lie to say that this still retains its power to legitimately startle, but something about the obvious archaism of the film stock and the editing technique works better than almost any other film I've seen of similar vintage to instantly snap the viewer - this viewer, at least - into the headspace required to appreciated something that, for all its unbelievable sophistication in 1913, is clearly the result of a much simpler time in cinema history (for context, the film Cabiria, which is typically credited with having invented the dolly shot, was still almost a full year in the future). No matter what, though, it's a strange opening gambit and it sets the viewer up for a strange film to come. The first part is by far the most straightforward: in disguise, Fantômas sneaks into the hotel room of a certain Princess Danidoff (Jane Faber), and begins stealing her jewels. When he is found out, he very calmly hands her a blank business card, finishes up and walks out in the most casual, unhurried way. She quickly snaps out of whatever stunned state the thief left her in, and calls up the house detective, but Fantômas is able to disguise himself as a bellboy and escape. It's the obvious outlier moment in the film, but it's such a nifty way to introduce the character who the next several hours will revolve around, and to establish the weird mash-up of the prosaic and the weird that would eventually be revealed as Feuillade's stock in trade (and maybe already was by this point: I am no Feuillade expert, and he'd already had quite a full career at Gaumont by this time). The second and third parts are more tightly linked, and tell something of an actual story: Fantômas has abducted Lord Beltham, the husband of his mistress, Lady Beltham (Renée Carl), and all of the Parisian police force is hunting for the missing noble. But no-one is looking more urgently than Inspector Juve (Edmond Bréon), aided by the intrepid reporter for La Capitale, Jérôme Fandor (Georges Melchior), and eventually Juve finds Beltham's body stashed in a trunk. He quickly susses out that Fantômas is hiding under the name of Gurn, and after a few weeks' stakeout, the killer is in custody. But the master criminal has a particularly sneaky, even karmic plan to get out: there's an actor, Valgrand (Volbert), currently starring in an opportunistic play based on the Gurn case, and Fantômas has a scheme to kidnap him in full Gurn makeup, and trade places, so that the hapless, drugged actor will be guillotined and the assassin will be off free in the Paris night. What happens is both the most important and the least important thing in In the Shadow of the Guillotine. 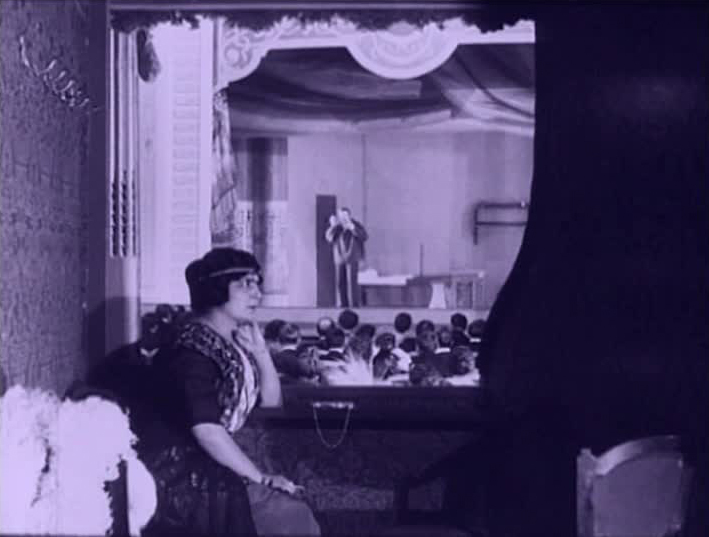 On the one hand, Feuillade's aesthetic is so spare that it's hard to argue with a straight face that there are stylistic elements that might command our attention; on the other, the film is chiefly best at creating a bizarre, off-kilter mood, and especially to modern eyes that aren't used to the proscenium-like staging the director favors, the film's visual appearance does, in fact, add a great deal of "what the hell am I watching?" queasiness. Quaint or not, the sequence where Valgrand is about to be execute is legitimately tense, because the film has such a foreign feeling to it that it's genuinely hard to predict where it's going. I'm almost completely certain that to get everything focused like that, the shot of the theater has to be a rear projection, which only makes the shot more impressive, but it's not just tech geekery that makes this stuff cool. It's the way that Feuillade's explosion into three dimensions creates an illusion of space, and implies an arena of action we're only partially privy to; the film being predicated on a constant sense of foreboding and mystery, this implication ends up being crucial in helping to build an anything-goes tone. As I sit and ponder, I see this as being built off a series of conscious contrasts: between the warped and terrifyingly violent (for 1913) content, and the stately boxes in which Feuillade composes it; between the depth of spaces and the flatness of the image depicting those spaces; between the everyday settings and actions, and the uncanny narrative. This series of disorienting contrasts is at the heart of In the Shadow of the Guillotine, which has to function not just as a narrative unto itself but as the set-up for four more, longer stories to come, and so has to build a world quickly and thoroughly. Mission fully accomplished.